Any of our readers ever listen to country music? There is something about Alan Jackson’s, “Daddy Let Me Drive,” song that just gets you in the mood to take you and the kids out on the water! There is one specific part of that song that always makes us a little sad at Anchor Marine Repair. When good ole Alan sings about having that boat for years until the transom got rotten, we just quiver a little bit around here! Unfortunately for Mr. Alan Jackson, his daddy never knew Anchor Marine Repair could fix that! Don’t let the boat that has made so many memories fade away. 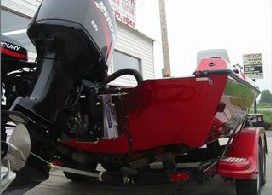 Located near the St. Paul/ Minneapolis area, our team at Anchor Marine Repair are your boat transom repair experts that will fix your boat transom damages so that you can continue to make those lifelong memories this boating season. Known as the strongest part of the vessel, the boat transom could be considered the heartbeat of the boat, or at least the rib cage that protects the heart. It is called the boat transom as it transmits the power of the engine to the rest of the hull and then transmits the pounding of the hull back to the engine. It is the hardest working part of your boat and takes more hits than any other spot. So, it’s not uncommon to have boat transom damages. This part of your boat is prone to weaken and wear and tear occurs. Often times, people will bring their boat into our Minnesota marine repair shop and the whole transom is rotted out. Once rot occurs, it can extend into the floors and stringers. Don’t let it get that far! Let the boat transom repair experts at Anchor Marine Repair help you and your memory maker! Repairing a boat transom is not for the uneducated. Good installation after boat transom damages are done is imperative! Our highly skilled and educated boat transom repair experts can fix your boat transom efficiently and correctly. We can make minor repairs or repair intense structural damage that starts in the boat transom and extends beyond to the rest of the vessel. If you have boat transom damages or notice even a small amount of weakening to your boat transom, it’s time to call your friendly Minnesota marine repair shop. Located near St Paul/Minneapolis, MN, we offer free pickup and delivery to any client within a 250 mile radius of the area. At Anchor Marine Repair, we are your boat transom repair experts ready to get you back on the water and making memories, while listening to an Alan Jackson song! For more information on boat transom damages and repair, call us today at 763-972-3540 or email us at service@anchormarinerepair.com.